A scenic vertical picture taken while hiking the Kalalau Trail located along the coast on Kauai, Hawaii. 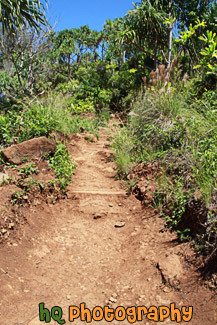 The Kalalau Trail is an 11 mile trail that leads from Ke'e Beach to Kalalau Beach. It is one of the most popular hikes in the world.